Thursdays are baking day for our new holiday guests arriving on the Friday, usually chocolate fudge cake, could be Victoria sponge with fresh cream and strawberries, fruit cake or savory quiche! 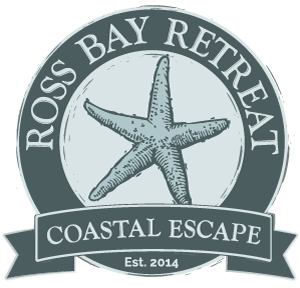 Sit down, eat, enjoy and relax, you have arrived at Ross Bay Retreat! 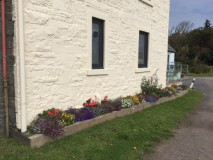 Our new flower beds outside Dairy House have settled and now showing smart colours – learning to garden at last! 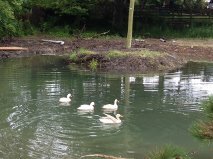 Our new duck pond which is now being enjoyed by the call ducks, aylesburys, and even the little but now bigger gosling. 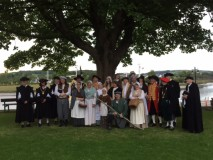 Well worth following is Maggie’s Tour on a Friday night, telling you all about the history of the town of Kirkcudbright. 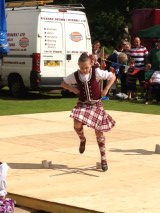 Kirkcudbright summer festivities every Thursday evening during the holidays, featuring highland dancing, bagpipes, windbands and lots of other entertainment – truly brilliant and a wonderful night out not to be missed. 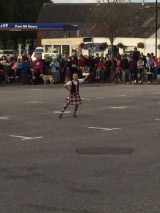 The sword dance being danced by our daughter at the civic week celebrations in Castle Douglas just in July. 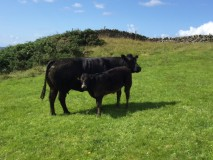 One of the cows with her calf enjoying life on Ross farm. 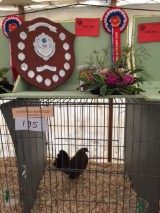 One of our bantams won a championship prize at the Wigtown show, for our son in the junior section. He also won best juvenile handler 2015. 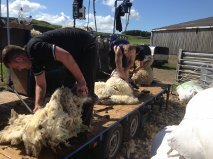 Here we are at clipping time with all the ewes being clipped and their wool being rolled up, bagged and sold off to make those wooley jumpers for Christmas. 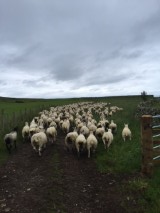 Bet they feel much cooler with their new hair cut! !